Five Star Doors offers 4 Chamberlain models simply for the added value to homeowners like an extra remote or keyless entry pad. In addition there are numerous features available that the LiftMaster openers lack. Add in the fact that the 2 belt driven openers shown below are arguably the two best overall rated openers available to homeowners. 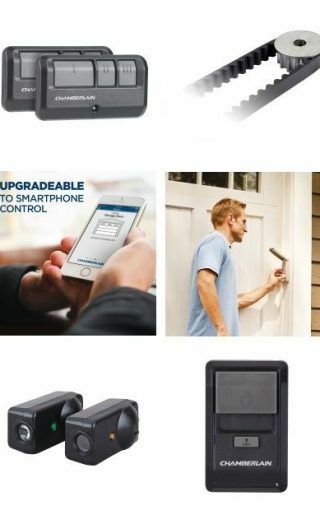 This belt-driven Chamberlain 1-1/4 HP – Wi-Fi Garage Door Opener is reliable and features packed, including built-in Internet connectivity for those who want the ability to monitor and control their garage door from anywhere they can get online. There’s also a backup battery, and the 1.25 motor is among the most powerful you can find in a residential opener. One advantage of a belt-driven garage door opener is that they are much quieter than chain-driven models. The 1.25 HP motor is strong enough for just about any task, and while the extra horsepower won’t provide more lifting capacity compared to 1/2 and 3/4 horsepower models, it means that the motor will strain less leading to longer life, quieter operation and better reliability. 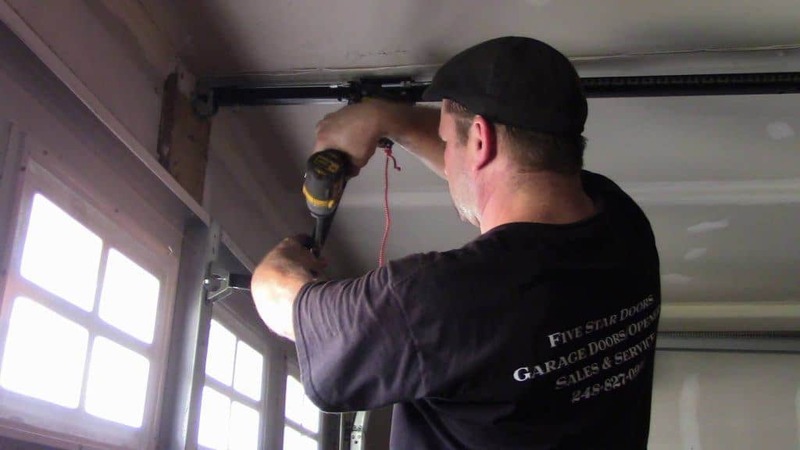 The option to open the garage door from anywhere comes in handy when someone stops by to pick something up or drop anything off when not at home. The app allows homeowners to open and close the garage door remotely anywhere your smartphone or PC has an Internet connection. The Chamberlain 1-1/4 HPS Wifi Garage Door Opener with Battery Backup can also send notifications when the garage door is opened. The option to customize the alerts and to get alerts on multiple devices is a huge benefit. This is one of the most feature packed garage-door openers available. Although many Chamberlain garage door openers are Internet compatible using Chamberlain’s MyQ technology, most require the purchase of an optional Internet gateway ($51.00) actually to connect to your home network. With the Chamberlain 1-1/4 HP, the gateway is built in. A battery back-up is another bonus. In the case of loss of power, it will open & close your garage door approximately 20 times Other features include safety sensors that will stop a closing door and reverse its motion if anything breaks its invisible beam, two multi function remotes, and a keyless entry pad. Lifetime Warranty for the Motor and Drive, 5 Year Warranty for Parts and 1 Year Warranty for Accessories Oiling and Adjusting Included. Garage doors are generally out of sight out of mind until they’re being opened or closed, and it wakes a family member out of a sound sleep. 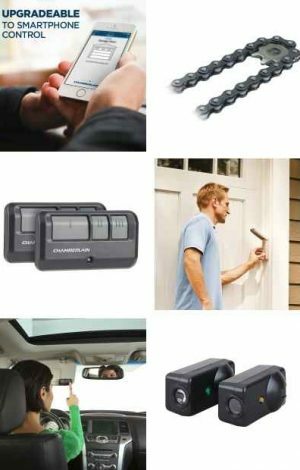 The safety features of the Chamberlain Belt Drive Garage Door Opener are precisely what you want in an automatic garage door opener which is safety. An infrared sensor beam on the Rapid-Snap Safety Sensor Brackets reverses the door when anything is in its path and stops it automatically if a person or object touches the door. The Chamberlain 1/2 HP Belt Drive also protects against theft and hackers. Its Security +2.0 technology offers Posi-Lock protection to keep the garage door safely locked when closed. Plus, every time you use the outdoor wireless keypad, it changes its internal operating code so hackers can’t access it. Garage Door Opener comes with Chamberlains built-in MyQ technology to keep you informed and secure. With the Myq app, you can open, and close the door from anywhere as well as check the status of your door with a smartphone or tablet device. Powered by Chamberlain’s MED Lift Power System™, the B550 delivers lifting force equivalent to 1/2 HP, the highest lifting capacity compared to other 1/2 HP models to provide easy lifting and reliability. While chain-drive openers are usually criticized for their noise, the MyQ-Enabled Chain Drive Garage Door Opener doesn’t entirely escape such criticism. Many of our customers are surprised by its relatively quiet operation. User reviews, while not many, are generally strong. At Home Depot, the Chamberlain PD762EV earns a 4.6-star rating after 285 reviews. Value and relatively quiet operation are oft-cited pluses, as is dependable operation. Most of the online criticism is directed at self-installation issues. If you are a do-it-yourselfer, self-installation takes on average 3 to 4 hours to complete, though not without a fair share of difficulty along the way. If you have doubts about your ability to handle the installation on your own, call Five Star Doors and we can have it usually installed within 24 hours. This unit is designed for a 7’ door; extension kits are available for 8’ doors for an additional $51.00. 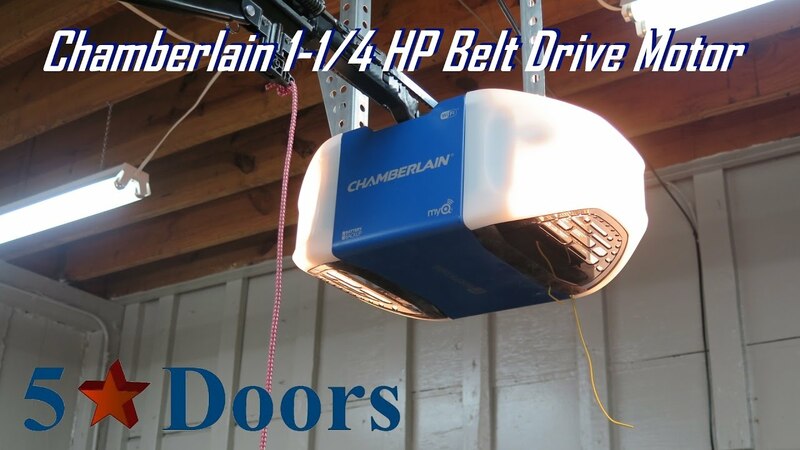 1/2 HP Power Drive Chain Garage Door Opener. Patented security plus 2.0 rolling code technologies along with multi-frequency transmitters help eliminate interference, providing consistent performance over a long range.